An earthquake and tsunami tore apart Sulawesi island in Indonesia Saturday killing at least 420 people. Among those killed was a young air traffic controller who sacrificed himself to guide an aircraft to safety during the 7.5 magnitude earthquake. Anthonius Gunawan Agung is being hailed a hero for saving the passengers on the plane. Agung was working at Mutiara SIS Al-Jufrie Airport when the earthquake struck. The young air traffic controller did not flee; he stayed at his post to ensure a plane with hundreds of passengers aboard was able to safely take off. His heroic actions guided Batik Air flight 6321 to safety as the airport control tower crumbled around him. The Sun reports that Agung feared he would become trapped in debris and decided to take his chances by jumping out of a fourth story window. He survived the fall with a broken leg and several internal injuries, but he died early Sunday morning. The moment that the tsunami struck the island was captured on video and depicts residents and tourists fleeing for safety as they realize what is coming. The earthquake and tsunami have left catastrophe in its wake and over 500 people injured. The powerful tsunami leveled buildings in close proximity to the beach. Another video shows the aftermath of the first wave from a similar vantage point as the first video. Photos show a bridge at Pula in Sulawesi before and after the earthquake and tsunami struck. Dozens of people are still believed to be trapped in the rubble of a hotel in Palu which took the brunt of the tsunami. Hundreds of people were gathered for a festival on the city's beach when the wall of water struck. The first wave swept many of the festival-goers to their deaths. Other powerful images show the moment that the tsunami overwhelmed the barrier and flooded the coastal villages. Indonesian President Joko Widodo is expected to visit evacuation centers in the Palu on Sunday. More video continues to appear on social media such as this angle shot from a boat just offshore of Sulawesi. Willem Rampangilei, Head of the national disaster management agency (BNPB), said the death toll has reached 420 people. "It’s estimated that 10,000 refugees are scattered in 50 points in Palu city," Rampangilei said. Another angle was taken from aboard a flight leaving the island. It is unknown if this is the flight that air traffic controller Agung gave his life to guide to safety. Rescue efforts have been impeded by the damage caused by the earthquake which leveled several important bridges vital to the island's infrastructure. 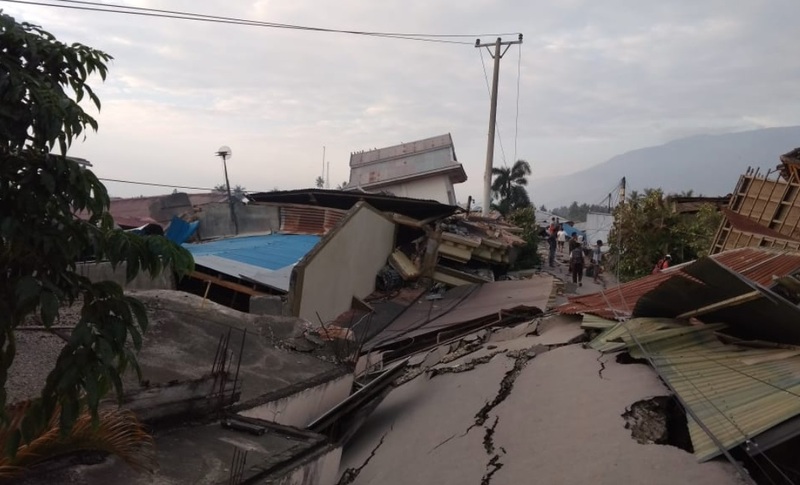 Head of the national disaster management Rampangilei said, "We are having difficulty deploying heavy equipment to find victims under the rubble of buildings because many of the roads leading to Palu city are damaged." The city of Palu remains without power and officials are scrambling to aid in the rescue efforts so a time frame for power to be restored is unknown. SevereweatherEU tweeted an alternate angle of the moment the tsunami struck Palu, Indonesia. The tsunami followed the 7.5 magnitude earthquake earlier that day. Photo clearly shows it was taken in Miyako (宮古市,. Miyako-shi) is a city located in Iwate Prefecture, JAPAN.